It's that time of the year when pumpkins are popping up everywhere. I made this one to show our Zentangle Club and also to be my entry for this week's Diva's challenge. It's not very spooky, but it sure was fun. 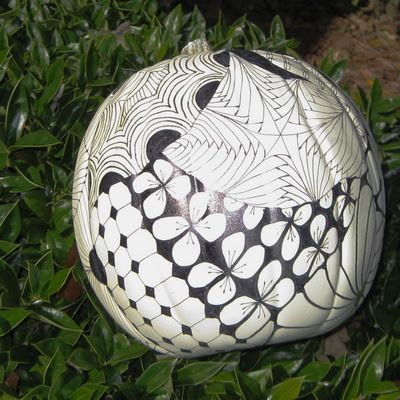 The first two views are of my pumpkin but the final view is of a pumpkin that my student, Nancy Smith made after seeing mine. I'm very impressed with the great job she did! 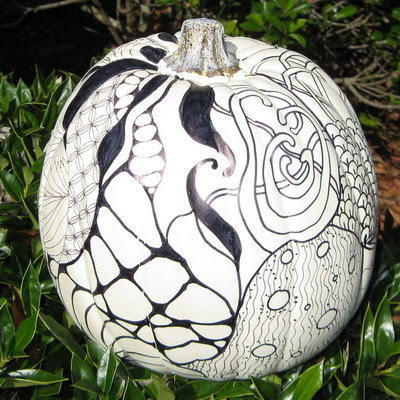 Nancy's pumpkin - in all it's awesomeness! Fantastic! What was your base paint? It must have been difficult working on that surface. Really quite amazing. 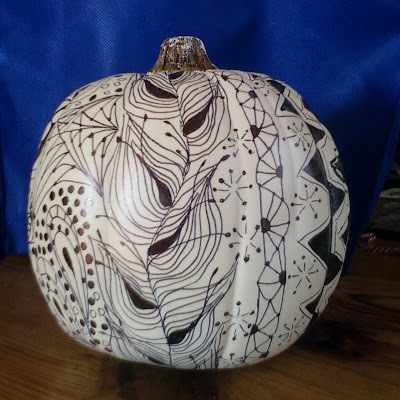 Susan, The pumpkins came from Micheal's - already white, I used Sharpies on it because on this surface the pigma pens smeared. Nice to see it in 3D! Good thing we got Sharpies! Lovely work! Well done. I've yet to try tangling on anything but paper. These look so great I might look around for something 3D to try. Joni, I love both pumpkins. The Betweed on your pumpkin is really great. Wonderful! I love them both! Both are wonderful. Next year I'll try this too. It's also such a beautiful present.